Brick, N.J.: Lindsey Avon and her 28-year-old husband Victor have been together for 10 years. But when Victor decided to lose some weight in college, Lindsey had no idea what he was really going through. It wasn’t until Victor checked himself into an inpatient eating disorder treatment center that Lindsey, 29, realized her then-boyfriend was fatally anorexic. Santa Cruz, Calif.: Nearly all of Avi Sinai’s school friends were girls, who constantly talked about how “fat” they were and how they longed to be thinner. Avi’s mom and his girlfriends’ mothers were shocked that Avi, just 10 at the time, was the one who succumbed to the obsession with being skinny. Okemos, Mich.: Susan Barry, 60, spends every day wishing she had known more about male anorexia when her son, TJ Warschefsky, was still alive. He died in 2007 at the age of 22 after an eight-year battle with the disease. His heart gave out in the middle of his nightly routine of 1,000 sit-ups. He weighed 78 pounds. 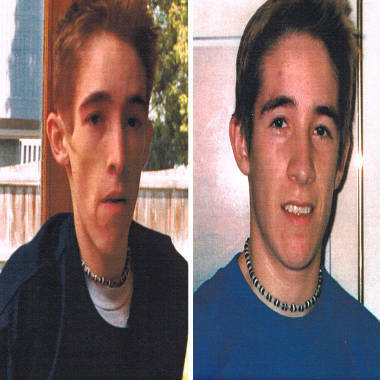 TJ Warschefsky is pictured here at the age of 21 before -- and after -- receiving three months of treatment at Rogers Memorial, a non-profit Psychiatric hospital in Wisconsin. His mother, Susan Barry, said her son's perfectionism and desire for control may have made him more vulnerable to the disease that eventually took his life. Warschefsky died of anorexia in 2007 at the age of 22 after an eight-year battle. He was 78 pounds at the time. CLICK HERE to view a list of resources for individuals coping with an eating disorder. Their stories may sound rare, but experts say cases like Avi Sinai, Victor Avon and TJ Warschefsky are growing more and more common. Far from the world of beauty magazines, pin-thin celebrities and runway models, anorexia is striking what many consider to be an unlikely group: boys and young men. “When the majority of people hear the word anorexia, they automatically assume it’s a girls' disease,” said Victor, who works in his family’s construction business and has since recovered. “The reality of anorexia is that it’s a psychological illness that does not discriminate,” he said. According to the National Eating Disorders Association, at least one million males in the United States are battling anorexia or bulimia. Yet due to the shame that often comes with male eating disorders, experts say the statistics are skewed, and many more young men are left unaccounted for. In 2007, he was the lead author of a large study on eating disorders in the United States, one of the first of its kind. The study found that one in four people suffering from anorexia or bulimia are male, contradicting prior estimates that only 10 percent of people with eating disorders were male. The assumption that anorexia can only affect girls and women not only increases the stigma for young men fighting the disease, but it also means that they are often too ashamed to seek help. That leads many to become even sicker than their female counterparts. “Boys don't get identified,” said Dr. James Lock, a psychiatrist at Lucile Packard Children’s Hospital, where Avi Sinai was hospitalized. On top of those hurdles, most of the resources that exist to help victims of anorexia are largely geared toward females, a fact that amplifies the feelings of isolation among male anorexics. When Victor was first diagnosed with the illness, he tried for months to find information online, but everything he read was tailored to girls and women. 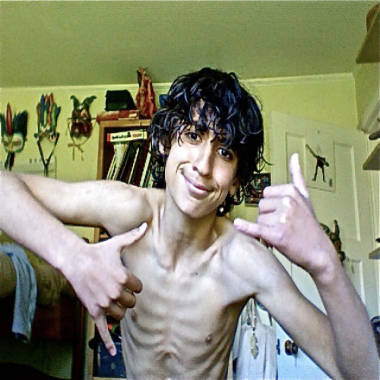 Avi Sinai, 14, began his battle with anorexia when he was just 10-years-old. Avi received treatment near his home in Santa Cruz, Calif., but is still recovering from the disorder. Victor finally found a treatment program for young men at Princeton University Medical Center, close to his home in Brick, N.J., but others are not as fortunate. When Susan Barry was looking for help for her son TJ, there was not a single residential program in their home state of Michigan that treated boys. It took more than a year for Barry to find an appropriate program for her son, eventually bringing TJ to Rogers Memorial Hospital in Wisconsin, hours away from his family. It was a similar crisis for Avi, now 14, when his family first sought treatment two years ago. According to Lock, it takes a certain kind of personality to develop the illness. While boys who participate in sports such as wrestling or track may be more likely to want to lose weight, Lock warned that the desire to enhance athletic performance should not be confused with anorexia. Athletic pressure may increase the motivation to lose weight, he said, but not every elite athlete has an eating disorder. Barry said her son TJ’s perfectionism and desire for control may have made him more vulnerable to the disease that eventually took his life. Because TJ’s anorexia took over his ability to reason, said Barry, it was impossible for him to recover. As baffling as the causes of anorexia may be, so are the factors behind the increase in the disease among boys and young men. Dr. Jennifer Hagman has been running the eating disorder program at Children’s Hospital Colorado since 1993, where until five years ago, it was uncommon for her to see boy patients. “Now we almost always have one to three boys in the program,” she said. According to Hagman, these boys are victims of society’s obsession with appearance and the increased focus on childhood obesity. While it is important to educate children to live healthy lives, said Hagman, it is just as important to deliver that message in a balanced way, without triggering unhealthy habits. For Susan Barry and Nancy Sinai, there is an even more crucial message for parents who think their children may be suffering from an eating disorder. “Just like cancer or any other disease, early detection is key,” said Susan. She acknowledged treatment wasn’t enough to save TJ from the downward spiral of his disease, but nonetheless, she encourages parents to do whatever they can to find help. NBC's Dr. Nancy Snyderman and NBC producer Mary Murray contributed to this report.